Sturdy piece of furniture. Light weight and comes fully assembled. 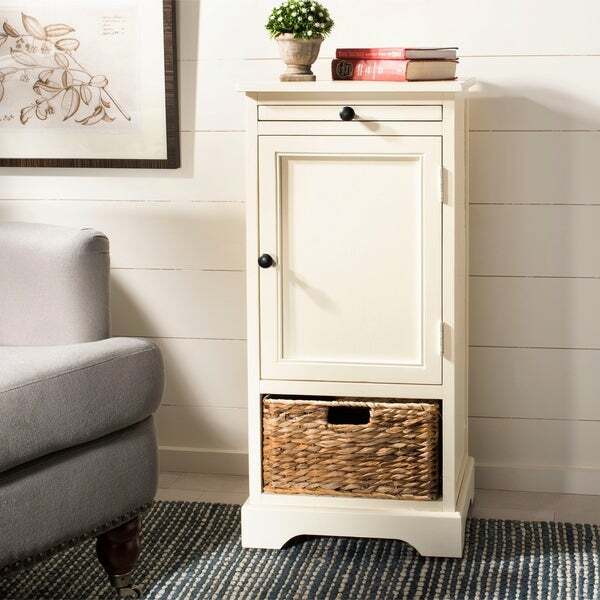 Relaxed and casual, the Cape Cod 2-drawer storage unit has anEasy-going appeal that is perfect for a country-casual style. Featured in a distressedcream color and crafted of durable pinewood, this distinguished piece has acontemporary style with a functional design. Its quaint disposition ensuresthat it will work equally well in a compact apartment or a spacious familyroom. Love this Safavieh Cape Cod 2 drawer tall storage unit. I love that it has a door and two drawers. The Cream color matches other pieces that I bought from another website that also has the basket drawers. Going to look great in my "new" spare bedroom when the new carpet is installed next week. I would recommend this to anyone that wants to update any area. I purchased two of these to use for additional storage in my bedroom. I should say that I've been a customer of Overstock for quite some time and have almost always really appreciated and enjoyed my purchases. This one is a bit odd. On the outside the cabinets look beautiful. The pull out extension "sticks" and almost topples the cabinet when you try to open it. The worst part is that the inside of the cabinets are not fully painted. They are streaked with black and smell of mold. One of the baskets also has black material on it. The other basket is fine though. I'm trying to figure out if I can fix this on my own because I don't want to pay to send these heavy items back and I had already discarded the boxes prior to noticing the mold smell. I am confident this is a manufacturer issue, not Overstock, but still I now have two cabinets that are subpar. Beautiful!!!!! I’m so very happy with this purchase. It was extremely well pachaged to protect the product! It was like a Russian nesting cabinet!! It was in 3 boxes with foam packaging in between each box. Once unpackaged, it was in perfect condition fully built. No assembly required! Woohoo! I bought it for my daughters room so she can put her Xbox on it, dvds inside it and have a little pull out shelf for writing or to rest a cup of water on. It does not take up too much space which is exactly why I purchased it. I want one for my bedside table now too. It was so great to receive and not have to assemble together. I love this item it’s perfect for my apartment for storage and in the future can be used for nightstands. I’ll be ordering an additional one. I like this cream storage unit. I bought it to go with the other matching tables that I purchased earlier.The Pull out table was damaged but we were able to glue it back on. This is a well made, simple nightstand that works great. I was looking for a small stand that had both shelves and a drawer, which is the basket in this case. I have a very high bed and wanted at nightstand that was also tall. I purchased 2 of these and they are great. No assembly required. Love the basket. The little pullout tray is nice for drinks. Solid wood, solid construction. Has great style! Love it! I love this piece! I use it as my mini Keurig station. This was the perfect bedside table for a large king size bed in our beach house. It is so good we couldn't be more pleased. Just wonderful. looks nice but does not sit flat on floor. Needs a little better craftsmanship. I will keep and fix because I do like the looks. I bought two of these to flank the side of my bed. Great for storage in tiny Manhattan apartments. matches the other one I bought last year. Need storage for next to my desk. Perfect height and storage space. "can you give me the dimensions please?" Thank you for contacting us, the dimensions are:34.3 in. H. x 15.7 in. W. x 13 in D.. Please let us know if you have any further question. "Does the cabinet have an interior shelf or is it just one open space?" Thanks for your interest, this cabinet features a shelf in the cupboard. "can the door be switched to hinge on the other side"
Thank you for your question. The door on the Cape Cod Cream 2-drawer Tall Storage Unit only opens one way and the hinge cannot be switched. "Is this product solid pine?" "Can you remove and change the knobs or are they affixed to the unit?" Thank you for your interest. Yes, you can change the knobs. Please feel free to contact us again with any further questions.